Chop the chocolate in small pieces. Beat the butter with sugar and eggs. Mix all the other ingredients in. 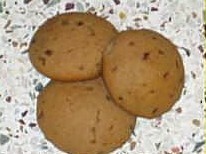 Shape the dough into small balls and bake 10-15 minutes at 175 degrees Celsius. Melt the butter in a pan, add the milk and the sugar, cacao and vanilla sugar. Bring to the boil and simmer until the mixture is 115 degrees Celsius (test by dropping some in cold water - it should form a soft ball). Allow the mixture to cool down 5 minutes, stir it for half a minute and then add in the nuts and raisins. Poor the mixture in a form, covered with aluminum foil. Cool down 2 hours and cut in pieces. 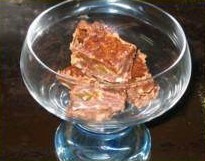 See also recipes for chocolate peanut fudge, white chocolate fudge and chocolate fudge.